Updated analysis of DNA admixture of Sri Lankan participants at HarappaDNA. There are 7 Sri Lankans (3 Sinhalese, 4 Tamils). I have not included the part Sri Lankans whose immediate parents are not from Sri Lanka. For comparison of Sri Lankan DNA with neighboring populations I have included seven other populations, TN Tamil(7), TN Tamil Brahmins(14), Kerala(10), Bengali(7), Punjabi(18) and Iranian(8). (TN=Tamil Nadu, (#) = the number of individuals). *please consider getting a DNA test. Its USD 99 at 23andMe. *All Charts are Interactive. Clicking on them will sort the chart or table and info on data point. Components are based on reference population peaks. Please see National Geographic Reference Populations Overview and Regions overview for lucid description of similar analysis. Do also have a look at the complete Harappa World Admixture. This analysis is a subset of Harappa World Admixture. 3) As expected Iranias have the least (3%). Europeans (not in this data) have 0%. Ranges from 40% (Punjabi's) to 29.1% (TN Tamil) for South Asian populations. Sinhalese and SL Tamils are in the mid range with approx 31%. Bengali's have the highest percentage (4.7%) of this component reflecting proximity of borders with SE Asian populations. Sinhalese have 1.6% of SE component while, TN-Tamils and SL-Tamils both have 1.3% of SE Asian component. The South Indian component is close to 60% for both Sinhalese and Tamils except for individual HRP0122 (49%) and HRP0232 (53%). HRP0232 is I, this blog author. The low f53% (for Sri Lankan) South Indian component is probably because of a maternal great grandmother who was probable European. Thats is reflected in the elevated NE European component of 4.7% compared other Sri Lankans with less than 2%. HRP0122 too has elevated NE European component of 4%. Maybe HRP0122 may care to comment on the elevated NE European component. HRP0122 and I we have corresponded by email and know of our identities. Table has the Sri Lankan (Sinhalese and Tamil) and few subset individuals with their Harappa ID, Self ID'd Ethnicity and Assigned Group Population for this Analysis. a) Excel Spreadsheet of Data used in this analysis. b) The complete World Admixture results at HarappaDNA. නවින විශාල සාම්පල පරියේෂණ ලබා ගත නොහැකි වුනා. එවාට ලිංක් දෙන්න පුලුවන්ද. ඔබතුමාගෙ ජාන පරියේෂණ කර ඇත්ද. ඇයි ඉතින් අපි ඊතල හිස අපේ පැත්තටම හරවගෙන ඉන්නෙ. ඇයි ඕක අනිත් පැත්තට වෙන්න බැරි. මෙහෙන් ගිය හරි එලවපු කට්ටිය නිසා හරි ඔක වෙන්න බැරිද? හැම ගොඩක්ම අපේ ගිණුම්වලට දාගන්න එකත් සහජීවනේ වගේ තවත් එක පිස්සුවක් තමයි. That means whole South Asian mixed by same ancestors in diffrent angle.Is it? Yes, South Asians are mixed by same ancestors but in different amounts. 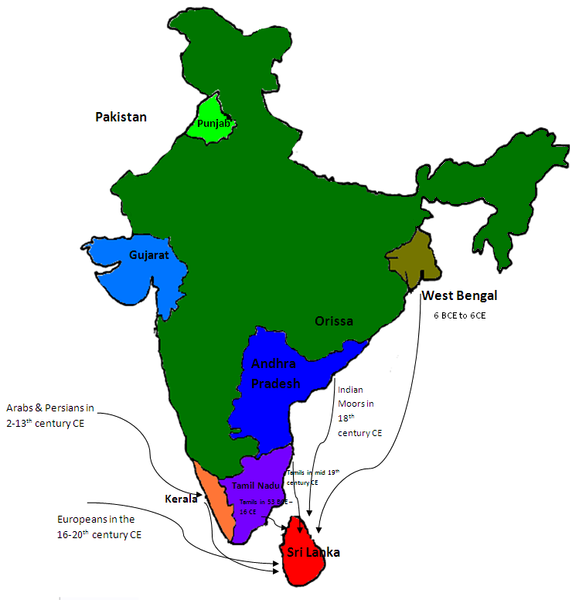 South Indians (and SL) have more ASI and less ANI. Its a very clear cline (slope) V shaped. "few words on the PCA (Principal Component Analysis) plot on this page. Its one of the few plots that I have seen where PCA captures the geographic distribution without a geo position data in the PCA analysis. What I am trying to say is the V shape of India's genetic Cline is evident in the in the PCA Plot." How did you create the interactive bar charts? I would like to create similar charts.